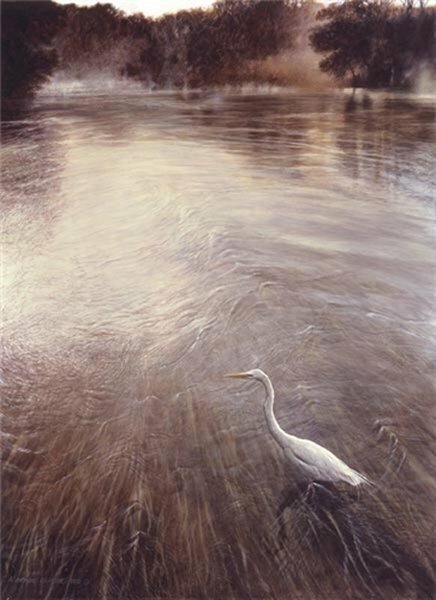 River of Grass by Matthew Hillier ~ River of Grass is one of the most beautiful paintings of flowing water that you will ever see. Hillier remembers, "I had taken a boatload of great photos of moving water with the long grasses flowing through it - making these wonderful patterns. So there I was, up in a tree, with my camera - and I realized I had a big problem. All this beautiful water --- and no bird to put in it. I knew it would be a tricky because I needed a shot of a bird taken from ABOVE the bird - looking down on it. I couldn't quite figure out how to get that kind of a shot! Well, as I looked around to figure out how to get out of the top of the tree - there he was - the egret - right below me in the water. Just standing right there where I could get the perfect shot! WOW! I knew I HAD to paint that!"